The titular educational/adventure game for generations of gamers has finally come to the iPhone. The Oregon Trail first premiered in 1971 and has gone through many editions, with the latest now on the iPhone platform thanks to the developers at Gameloft. The object of the game remains the same as it always has: lead your party of settlers from Missouri to Oregon in 1848. You’ll be in charge of ensuring their survival by making decisions on how to travel, avoid danger, and stay healthy. I’ll admit that I was hesitant to review this latest version of Oregon Trail—how can you update a classic without the usual pitfalls of unoriginality or offending its legions of fans? 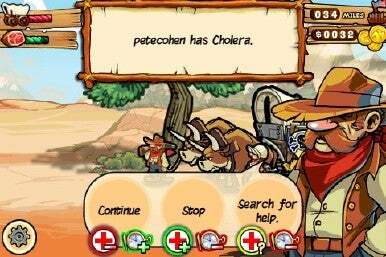 Dysentery, cholera and other hazards of frontier life will challenge you in The Oregon Trail. The answer is in the details. The entire game gets a cartoon makeover that makes it visually distinct from previous versions and automatically sets the game’s tone as more light-hearted. Cartoon exaggerations allow for moments of slapstick fun such as when one of your party members gets eaten by a snake or your Yosemite Sam-like party leader remarks about how “majestic” eagles are before he picks one off for dinner. The game’s system has been revamped as well, eliminating some choices for the player (you’ll never be asked which kind of medicine to give a party member, just whether to rest, continue, or seek help) and expanding others (now you can fish, pick berries, pick up hitchhikers and much more). The game has plenty of funny moments. Upon reaching certain landmarks, you’ll often witness your character’s family offer humorous banter in the form of text bubbles (“Are we there yet?” “No!”). Historical figures like Annie Oakley, Wyatt Earp, and George Donner show up at certain locations and you can choose to embark on quests for them. They’ll reward you with gold, wagon parts, or food. One of the weirdest moments of the game: George Donner rewards you for meeting up with him by giving you “meat” that is very “fresh.” Ewww. The iPhone edition keeps a lot of the classic Oregon Trail details intact. You’ll be able to customize the name and genders of your party members, though they only give a sparse number of characters for each name. I named my party members after my fellow Macworld editors. All survived, despite my attempts to leave Peter Cohen behind. You’ll also be able to choose your wagon type, month of departure, pace, and occupation—all important elements that will determine your success. Other details have been left out—there are less items to buy and you won’t be micromanaging as much. The only two resources you need to watch are food and wagon parts. The faster you travel, the quicker these resources deplete. You’ll be able to purchase upgraded parts later on in the trail, but you’ll never have to barter for spare axels ever again. While traveling, you get a nice visual of the terrain and your characters’ progress. You can see the weather changes, the dangers they encounter, and even the landmarks. In addition to the iconic stops like Chimney Rock, you’ll find places to hunt, fish, and pick berries. You can’t hunt just anywhere, and though this initially bothered me I realized one of the biggest cheats in the previous editions is that if you just bought lots of bullets and no food, you could simply hunt your way to Oregon and not starve. The developers not only limited the number of times you could hunt, but also introduced other minigames like fishing, berry picking, wagon repairing, and telegraph sending to provide variety. All of these provide the player with food, repairs, or money and are well integrated into the gameplay, but I did find telegraph sending to be buggy at times. The iPhone’s motion controls and touchscreen provide unique opportunities for gaming, and Oregon Trail provides some beautifully crafted moments that truly utilize the system to its potential. You can tilt the phone when sifting for gold or navigating a wagon down a river; you can touch berries as they appear during a berry picking minigame, and you can throw a line and catch fish during a fishing segment. An average game takes several hours to complete, but if you ever need to stop Oregon Trail will automatically save and bring you back to your last landmark next time you start. Frustratingly, there isn’t a manual save option at this time. With a game length of several hours, battery life obviously becomes an issue with the iPhone. I’ve yet to play a game on the iPhone that saps battery life as quickly as Oregon Trail. I played it for several hours and didn’t even finish my game before my phone began to warn me about the rapidly depleting battery. Long load times also break up the flow of the game and virtually every minigame and landmark requires loading. When you venture to a fort, the different buildings (post office, general store, etc) require long loads to enter and exit. Gameloft does a lot of things brilliantly in this latest edition of Oregon Trail. The visual style is fun, the controls are intuitive, there’s plenty of new content and it’s genuinely funny. If players can get beyond the long load times and the drain on their iPhone’s battery, this is a rich and rewarding experience. The Oregon Trail is compatible with any iPhone or iPod touch running the iPhone 2.2.1 software update.